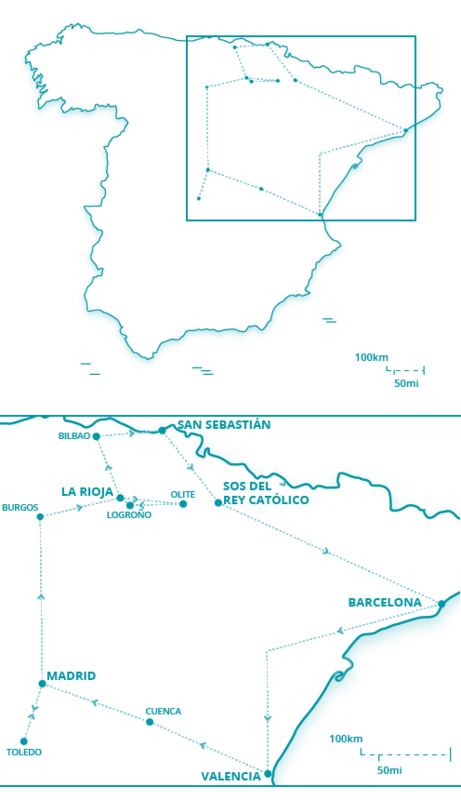 We offer a comprehensive set of services that allow you to discover Spain in an independent, safe and comfortable way. Come with us on a 15-day journey around Spain. We begin in the captivating, cosmopolitan city of Madrid, with its palatial buildings, Italian and French-style gardens, art museums and traditional neighbourhoods. We then move on to Toledo and Burgos and the enchanting town of Laguardia. In the middle of your tour, you will visit San Sebastian, the city famous for its delicious pintxos and stunning Bahia de la Concha. Arriving in Barcelona, breathe in the special energy of this city which everybody loves. Finally, visit Valencia and Cuenca and return, Madrid. Here, don’t say “goodbye” to Spain, but rather “see you soon”! We had a great time on the trip. Can’t believe that we checked into 8 hotels, rented two cars with a transfer in between, went on at least 7 excursions and there were zero hiccups! Your organizational skills were amazing. I hope you don’t mind but I have copied Julie on this email. She is traveling to Spain and Portugal and we would like to make her our first referral to you. There will be many more. Julie is a world class traveler and knows everyone so the word will spread fast about you if she is as happy with your services as we were. The trip was great. We really enjoyed the east coast of Spain and all of the hotels were perfect in terms of quality and location. Walking tour was great, GPS well programmed and hotel/airport pick-ups on time. Finally the itinerary worked well.